The Mission of Oceanfront Yoga is to provide you with an authentic yoga experience in a spectacular setting to prepare you for your day of adventure, work or play. Johanna’s oceanfront yoga classes are comprehensive, moderate level practice that uses a combination of asana (posture), pranayama (breathwork) and meditation for a healthy way of living. 10 class punchcards are available for $140 (6 month expiration, keep in mind we are not responsible for lost cards). * Weather Permitting. Oceanfront yoga is an outdoor only class. The class will be cancelled if there is rain or extreme weather. guest of the Kamaole Nalu. The Ocean front public yoga class is on a first come first serve basis, so please come early and bring a mat or towel. Communal mats are available to rent for $2.00 each. Please wipe down your mat after use with provided wipes. 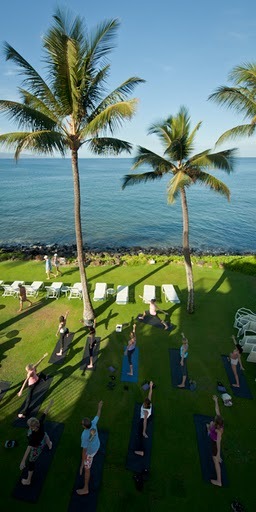 Oceanfront Yoga by Johanna Waters, at The Kamaole Nalu Resort, 2450 S. Kihei Rd. Meet at shoreline, park on the street or the parking lot across from Kamaole Nalu (please do not park at the Kamaole Nalu parking lot), walk thru parking lot, follow concrete walkway, pass elevator, head towards ocean. We meet on the grass in front of the ocean. And meditation for a healthy way of living. Congratulations on making the decision to try something new! My oceanfront yoga class is encouraging and supportive to those that are new to yoga. Let me know if you have any specific questions so that I can make you feel comfortable in practicing one of the best forms of self care. Yoga is for every – body, so there are many ways to adapt or modify the class to make it easier or more challenging, depending on your physicality.